↑ "Warren E Buffett, CEO Compensation". Forbes.com. 2006-03-30. สืบค้นเมื่อ 2009-02-23. ↑ "How Does Warren Buffett Get Married? Frugally, It Turns Out". New York Times. 2006-09-01. สืบค้นเมื่อ 2008-05-20. ↑ "The Greatest Investors: Warren Buffett". Investopedia.com. สืบค้นเมื่อ 2009-03-06. ↑ "#1 Warren Buffett". Forbes.com. 2008-02-11. สืบค้นเมื่อ 2009-02-23. ↑ Sullivan, Aline (1997-12-20). 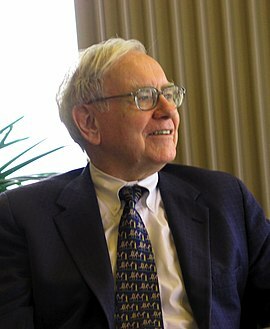 "Buffett, the Sage of Omaha, Makes Value Strategy Seem Simple: Secrets of a High Plains Investor". International Herald Tribune. หน้านี้แก้ไขล่าสุดเมื่อวันที่ 2 พฤศจิกายน 2561 เวลา 13:34 น.